George Edward Lynch Cotton was the only son of Capt.Thomas D’Avenant Cotton, 7th Foot, and Mary Headley Burnley of Halifax, Nova Scotia. He was admitted to Grant’s House in 1825 and became a King’s Scholar in 1828. He appears to have been fairly unhappy at the school, which could be a rough place at that time. He used humour to diffuse conflicts within the house and protect younger pupils from bullying. A contemporary remembered that ‘he would get some tyrant of ours into conversation about his threats or his summary proceedings, and by a Socratic process draw from him some very damaging admissions against himself; breaking, when he had achieved this triumph into that half-suppressed chuckle which was so characteristic of him at all times’. An academic pupil he was elected head to Trinity College Cambridge in 1832 and initially pursued an academic career. He worked as an Assistant Master at Rugby School from 1837-52 and features as the “young master” of Tom Brown’s Schooldays. He became a close friend of Thomas Arnold, the famous reforming Headmaster of Rugby School and was strongly influenced by his approach to education. 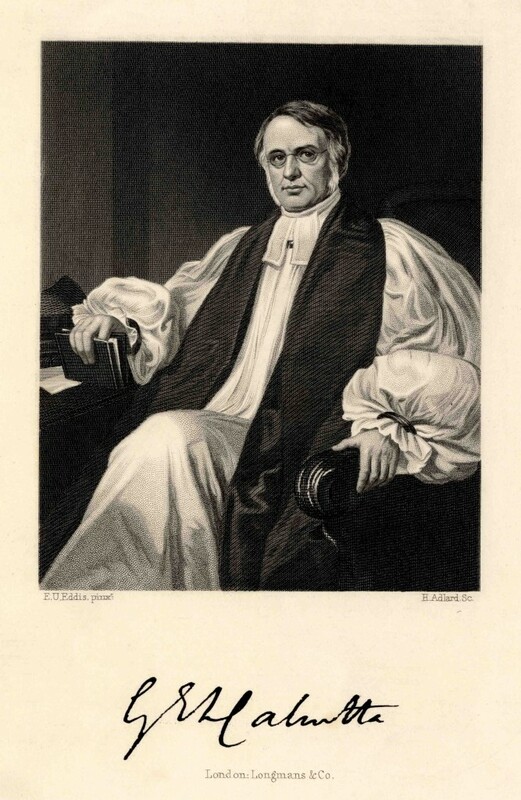 Cotton went on to become Headmaster of Marlborough College where he remained for six years before his appointment as Bishop of Calcutta from 1858. Initially hesitant about accepting the position abroad, Cotton felt that since the government of India had been transferred to the crown from the British East India Company, there might be opportunities to improve the provision of education in the country. He established several schools in the country and Bishop Cotton School Shimla and Bishop Cotton Boys School Bangalore still bear his name. On 6th October 1866, he had consecrated a cemetery at Kushtea on the Ganges and was crossing a plank leading from the bank to the steamer when he slipped and fell into the river. He was carried away by the current and never seen again. He is pictured right in the robes of this office.